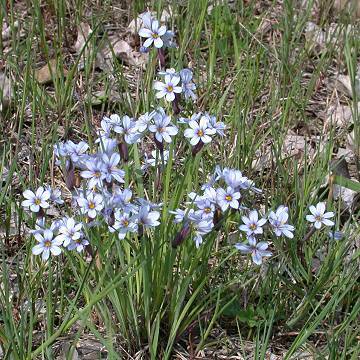 Often with Hypoxis hirsuta in prairies. NY west to ND, south to GA and OK.
Herbaceous perennial monocot to 40 cm; pale green and somewhat glaucous; stems winged. Leaves 1.5-4 mm wide. Spathes mostly paired at the stop of the simple stem, the lower (outer) one with a foliaceous outer bract longer than the other bracts; inner floral bracts 2 or rarely 3, often purple-tinged; tepals 8-12 mm, blue-violet or white. Common in the Chicago region and widespread in the northeast.